Open Cell Foam is a polyurethane based foam, it uses different Catalyst and Blowing agents in its chemistry and is different than a closed cell foam, which is also a polyurethane-based foam. Open cell foam typically has an R value from 2.8 to 4.1 depending on the manufacturers blend. Open Cell Foam is also called Half Pound Foam or Low Density Foam. Open Cell Foam typically has a lower R-value per inch then close cell foam, meaning it needs more inches to meet the state or local building code requirements. Open Cell Foam typically uses water as the blowing agent, although some blends vary depending on manufacturer. Open Cell Foam is softer and does not give any structural strength. The spray applications are the same for open and closed Foam the technique might be slightly different. Open Cell Foam typically requires more labor for shaving and cleaning. This is required to allow proper installation of the sheetrock and to allow it to go on to the surface without popping the screws. Depending on climate zone, Town and State Building Codes may need to be covered with an additional vapor barrier. Open cell foam is not considered a Class 1 Vapor retarder, until you hit over 14 inches this is dependent on the manufacturer testing. Open Cell Foam will also allow moisture to travel through it and with capillary action can allow wicking to occur. It is never recommended to be installed on top of a concrete surface for that reason or in areas like dirt crawl spaces. Open Cell Foam is typically cheaper than closed cell foam per inch and in some applications can be significant cost savings. It still a great product and fits into people’s budgets better than a closed cell foam. Be careful when hiring your contractor and sometimes they will install open cell foam and tell you you’re getting close though ask them for samples of both verify what you have received is what they quoted. Spray polyurethane does have some inherited health risk when being installed, it off gases and no one should be inside the property for 24 to 48 hours after completion of the spring process this is for your own health and safety any company that allows you to stay inside your house while spraying is not a company looking out after your well-being. Closed-Cell Polyurethane Foam is also called High Density Foam or Two Pound Foam. There is also hybrid blends ranging from one pound density to 1.5 pounds, these are not the same quality foams as a Two Pound Close Cell Foam, but sales people will tell you it is a closed cell foam. Two Pound Close Cell Foam has an R-value of R 6 – 7.5 depending on the manufacturer blend. The Closed Cell Foam market has changed quite a bit over last 10 years, there is newer, lower, ozone-depleting, blowing agent. They have high lift products now, that can get up to six inches maximum lift per pass, other foams in the market can only do two to three inches maximum pass per lift. Those run the risk of an exothermic fire and spontaneous combustion, if they spray the product to thick, this comes down to the quality of the sprayer at the end of the gun and his training. Closed Cell Foam at 1 inch becomes a class 1 vapor retarder. Closed-Cell Spray Foam insulation can add up to 300% structural racking strength. I have a photo on my website that shows me and two other guys standing on a cardboard box over 650 pounds standing on three inches of foam, to illustrate the strength you can receive in this product. 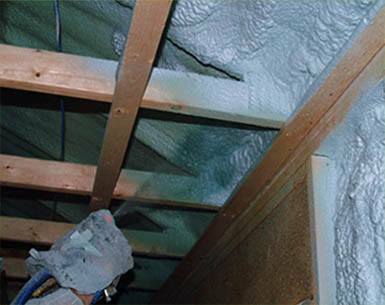 Closed Cell Foam Insulation is the very best product on the market today for insulation. This information is here to help you make an educated decision. If you need more information or have any questions please feel free to contact us.